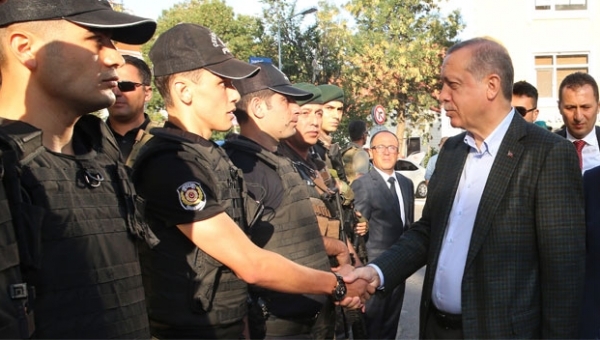 Two police officers in the western province of Bursa have been handed down a jail sentence of 10 months on charges of insulting President Recep Tayyip Erdoğan. Gürsu district police chief Kadriye Kaçar and police officer Burhan Kaya are accused of insulting Erdoğan on the night of a failed coup attempt on July 15. A case was launched against them after their colleagues filed complaints, claiming that they made insulting statements about Erdoğan on the night of July 15 and decided to hand over their service revolvers to coup soldiers in the event of a raid, although they were ordered to resist them. The police officers deny the charges. Insulting the president is a crime in Turkey, according to the controversial Article 299 of the Turkish Penal Code (TCK). Whoever insults the president can face up to four years in prison, a sentence that can be increased if the crime is committed through the mass media.